Work has started on the £8.5m cinema and restaurant complex designed by The Harris Partnership for Doncaster’s new Cultural and Civic Quarter. 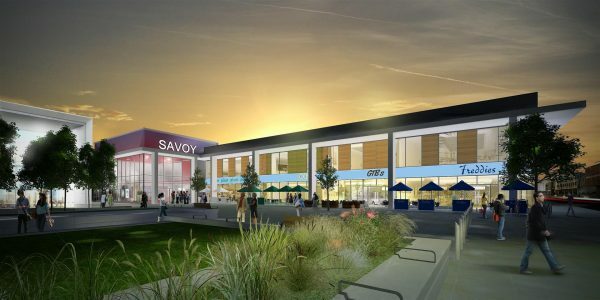 Doncaster Council has signed an agreement with Savoy to operate the cinema which represents a major development in the council’s Urban Centre Masterplan to transform the town centre, and is already receiving interest from local and national restaurant businesses. Dan Jarvis, mayor of the Sheffield City Region, added: “It’s great to see that work has started on the long-awaited cinema and restaurant complex, which is an important piece in the jigsaw of Doncaster’s Cultural and Civic Quarter. First phase of works include setting up the site, undertaking technical surveys, site clearance and groundworks before main construction commences in May. The new development is planned to open in spring 2020 creating more than 100 jobs and generating new business rates for the borough.